Students from Rio Salado's Alpha Theta Omicron chapter of the Phi Theta Kappa Honor Society are collecting items to donate to homeless individuals as part of a community service project. Donation boxes will be available at Rio Salado locations through Thursday, Aug. 6. "We chose this project as a way to directly help those who are homeless have some necessary items for personal use," said PTK Chapter President Vanessa Williams. "Everyday there are homeless people out there who are unable to take care of some of their most basic needs. Washing their hair, washing their face. For someone who can’t do this, that little bit of dignity to stay clean can make a world of difference. Having sunscreen would help keep their bodies and skin from being sunburned." Care packages will be distributed at Tempe Town Park. Additional items needed include, band aids, baseball caps, ponytail holders, water bottles, AAA batteries, deodorant, laundry detergent pods, heavy duty combs, safety pins, mini sewing kits, body wash, wash cloths, shampoo, conditioner. PTK will also accept monetary donations. Volunteers are welcome for the assembly of care packages as well as distribution. To donate or volunteer, contact John Bastian at 480-517-8656. 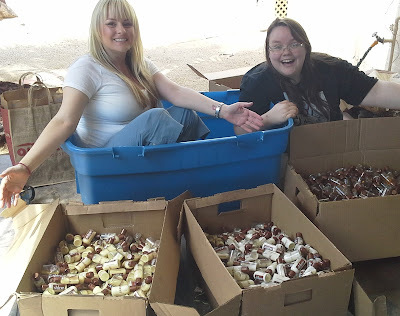 Pictured above: PTK Officer Christy Neighbors and PTK Chair for Honors-in-Action Project Theresa Maheux.